Montenegro, a Balkan tiny state which is packed with natural and architectural beauty. 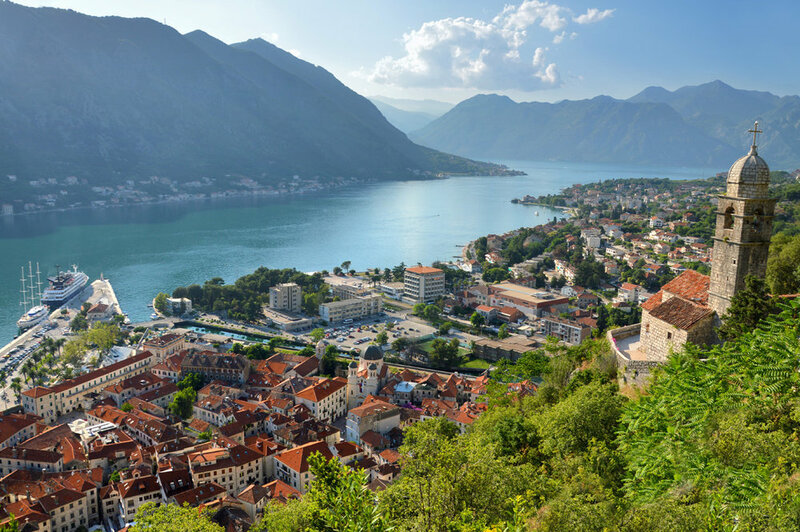 The coast is especially magnificent - beautiful beaches, caves, cliffs, spectacular mountains of the Kotor Bay intertwined with cozy, little red-roofed old towns. However, if you expect Montenegro to be off the beaten path like its neighbors - Albania, Kosovo and Macedonia, you might be surprised. It might be less known in the west, but Montenegro is packed with vacationers from the East and it has the vibe similar to Croatian or Spanish resorts. The most famous attraction - Sveti Stefan is truly unique, but unfortunately the island itself closed off to the public. And the beach around is probably one of the most expensive in Europe - a sunbed costs 50 EUR! A "Blue Cave" is a popular attraction in many countries - I visited one in Greece, in Malta or Brazil (click on the links to see my posts). Montenegro is less known in the West and not as famous as other popular destinations but it's good to know that this tiny Balkan country also has its own, beautiful Blue Cave. Although the most visited attractions of Montenegro are the spectacular Kotor Bay and the peculiar (and extremely expensive) St. Stephan's Island, the Blue Cave is also a cool place to see, especially when combined with the charming town of Herceg Novi (take a look at my post about it) and the nearby Zanjice beach. Montenegro isn’t a place that is on the usual tourist trail. In fact it’s a country that many of us know very little about. Formerly part of Yugoslavia, the tiny Adriatic nation has only been independent since 2006 and rarely gets mentioned in international news. In the next couple of months, though, anyone with an interest in international football betting will see Montenegro’s name popping up on the odds, as the country faces Moldova, Austria and Russia in the Euro 2016 qualifiers, which are taking place throughout September and October. But though the country might be unfamiliar, there’s a growing number of travellers who are making their way to see what Montenegro has to offer and the majority are finding it to be full of interesting things to see and do. Herceg Novi (meaning "new castle") is a charming little town located at the entrance of lush green, beautifully surrounded by mountains Kotor Bay. It can be a good, more quiet alternative to overcrowded with tourists Croatian towns like Dubrovnik or Split. However, don't expect to see only locals there. Tourism in Montenegro is on the rise but Herceg Novi is still not as packed as, for example, other Montenegrin destinations - Budva (a party town where the famous Sveti Stefan island is situated), or Kotor.